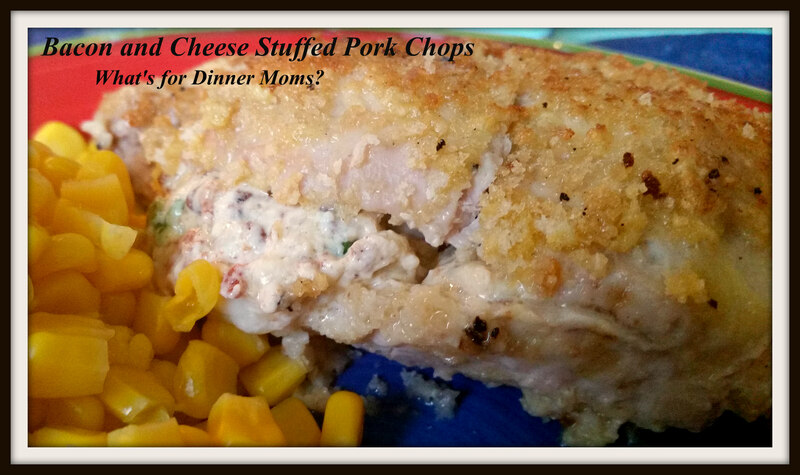 Bacon and Cheese Stuffed Pork Chops – What's for Dinner Moms? I can’t believe that everyone was home before 8:00 pm the other night. It was such a treat for all of us to be together at 6:00 pm and cooking dinner together. That hasn’t happened in quite a while. One of my kids sets the table and gets the condiments ready while the other pours water for everyone. Sometimes the dishwasher needs to be unloaded too so one of them has to do that too. We are stirring and laughing. That is what is important to me. We are all in this small space together. Even though dear daughter was grumpy last night, it is the end of the school year, we still were able to laugh and almost make her smile. If anyone else has a teen or tween sometimes almost getting them to smile is as good as it gets some days. These were yummy! I am not a big fan of boneless pork chops but these were well cooked and the creamy, salty stuffing perfectly complemented the pork. I made one for my daughter without the chives and she was happy to not have onions. You can customize the filling to your family. For my mostly gluten-free son I used baking mix instead of flour to dip the pork chops in and gluten-free bread crumbs. You could not tell the difference in the pork chops and my son loved that. I served these with corn and brown beans. 6-8 boneless pork chops (thick) – about 2 lbs. Preheat oven to 350 degrees. Spray a 13 x 9 baking dish with non-stick spray. In a bowl mix, with a fork, cream cheese, bacon, chives, cheese, garlic powder, onion powder, salt and pepper until well blended. Taste and adjust spices to your liking. Take one pork chop and hold it vertically so you can cut through the side of the pork chop to create a small pocket 3/4 of the way through the chop. Do NOT cut all the way through the chop or the top and the bottom. Stuff 1/6th or 1/8th of the cream cheese filling into the pocket and push gently to seal it shut. Roll the pork chop in flour (or baking mix), then egg and finally bread crumbs. Place the pork chop on a baking sheet. Repeat steps 3 and 4 with all pork chops. In a medium skillet over medium high heat add oil to pan and allow to warm. Add pork chops 2 at a time and allow to brown for 2-4 minutes until golden brown on each side. Turn each chop only once. Place cooked pork chops in prepared casserole dish. Once all pork chops are browned place in oven and bake for 15-20 minutes depending on thickness of chops. Be careful not to over cook the pork. Thanks! I agree anything with bacon and cheese has to be good! most welcome! always yummy Marci! Wow aren’t those nights special Marci? The chops look yummy! Thank you! Yes, I love when we are all together. I’ve had a weird aversion to chicken ever since it tasted terrible when i was pregnant, like I can’t quite forget the funky flavor. But beef gets boring, night after night, so I love good pork recipes to change things up. Everything is good with bacon…and cheese…..
Pingback: Top 5 Blog Posts – February 2018 – What's for Dinner Moms? Bacon, cheese AND pork chops? Woop woop! Yes! It is so rich and good.